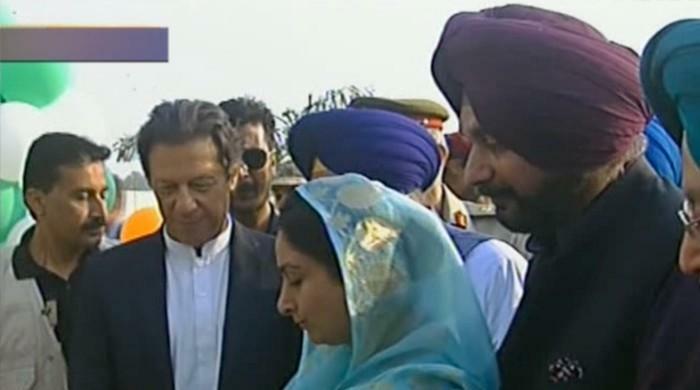 Prime Minister Imran Khan on Wednesday performed the groundbreaking of the long-awaited corridor connecting Gurdwara Darbar Sahib in Kartarpur area of Narowal district to Dera Baba Nanak in India’s Gurdaspur district today. A large number of Sikh yatris ─ both local and Indian ─ along with Indian Minister for Food Harsimrat Kaur Badal and Minister for Housing Hardeep S. Puri, and Indian journalists and foreign diplomats are attending the ceremony. Chief of Army Staff Gen Qamar Javed Bajwa, Minister for Religious Affairs Noorul Haq Qadri, Foreign Minister Shah Mahmood Qureshi, Punjab Chief Minister Usman Buzdar, Railways Minister Sheikh Rasheed, and Minister of State for Interior Shehryar Afridi are also in attendance. The event began with the airing of a film about the pilgrimage of members of the Sikh community to the Gurdwara Darbar Sahib. The Pakistan government will open the four-kilometre-long visa-free corridor on Baba Guru Nanak’s 550th birth anniversary next year. The project will be completed keeping in view the needs of the Sikh community. Noorul Haq Qadri addressed the ceremony first, beginning his speech by greeting the premier, the COAS, the Indian delegation and all those attending. “Today we are at an important point in history,” Qadri said. “This is where he left the world. I am referring to Baba Guru Nanak,” he said. “The Kartarpur gurdwara will be made into a state-of-the-art gurdwara,” he said. “Next year in November, a year from now, on the 550th birth anniversary of Baba Guru Nanak, the Pakistani government and the country are preparing to celebrate in a grand manner,” he announced. Former cricketer-turned-politician Navjot Singh Sidhu took the stage amid loud applause and cheering. “India’s Constitution says there will be no discrimination on the basis of caste or creed. Baba Guru Nanak said this 549 years ago,” Sidhu said. He said there had been enough bad blood and that the corridor would be a major opportunity to open the doors of the hearts of the people. Sidhu said that if the borders between both countries opened, it would be possible to transport goods to different parts of Pakistan and even others countries. “This is my hope, this is my dream … While there is blood in my veins, I will continue to thank both governments,” he said. Indian Minister for Food Harsimrat Kaur Badal also addressed attendees with an emotional speech. Guru Nanak spent his last years on the other side of the border, just four kilometers away, she said, adding that at times the chanting of devotees can be heard on the Indian side of the border. “I have no friends, no relatives here [in Pakistan]. I never thought I would be here,” she said. “Today this corridor will bring everyone together … It will bring joy and peace to both countries. I beseech you … to issue postage stamps or coins to commemorate Guru Nanak,” she said. Foreign Minister Shah Mahmood Qureshi welcomed Sikh brothers and sisters attending the ceremony. “Today we are laying a foundation stone for the Kartarpur corridor and fulfilling the wishes of our Sikh community,” he said.